Since 2005 the National Project Tak'alik Ab'aj is conducting an excavation program aimed to recover the information about the context of the sculptures at Tak'alik Ab'aj. 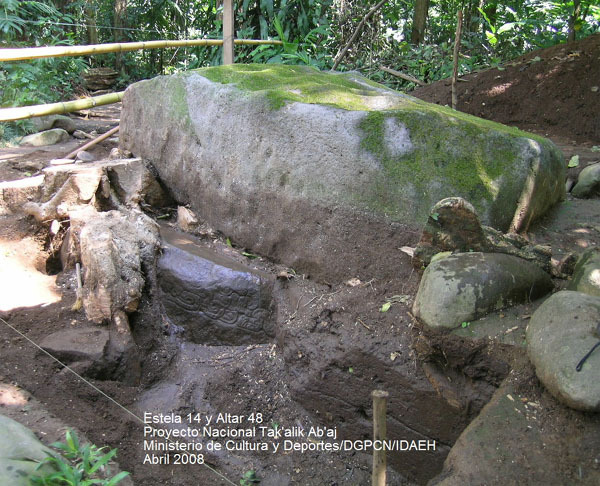 That is how a new sculpture, Altar 48, was found underneath Stele 14. 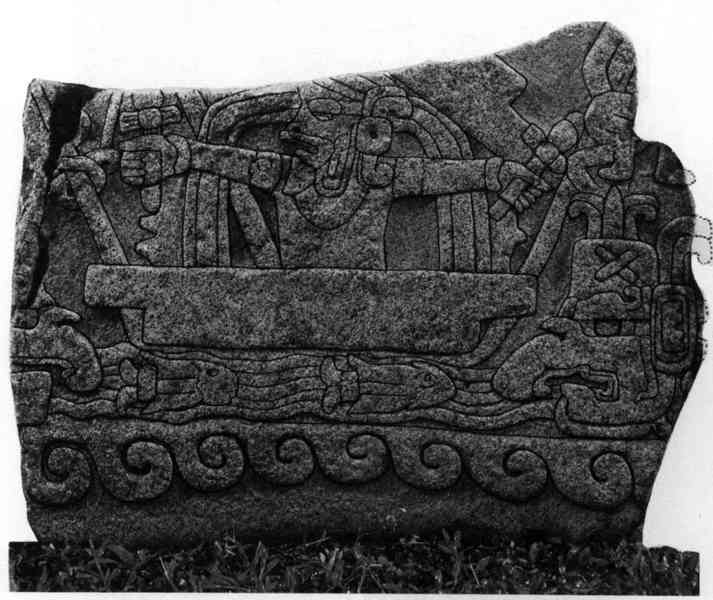 This monumental stele had been positioned carefully above Altar 48 in order to protect it, which gives a hint about the magnitude of the meaning of this altar. 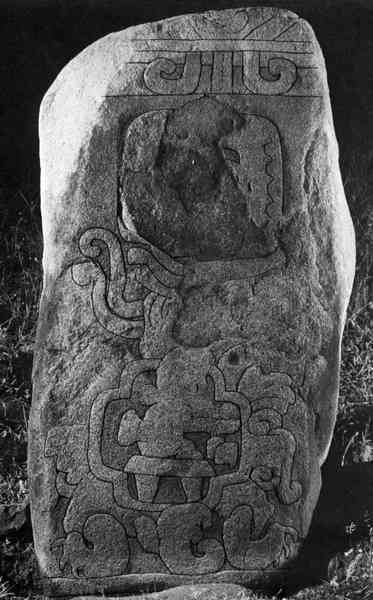 Altar 48 portrays on its surface the beautiful design of a crocodile with the quatrefoil symbol of the cave or portal on its back. 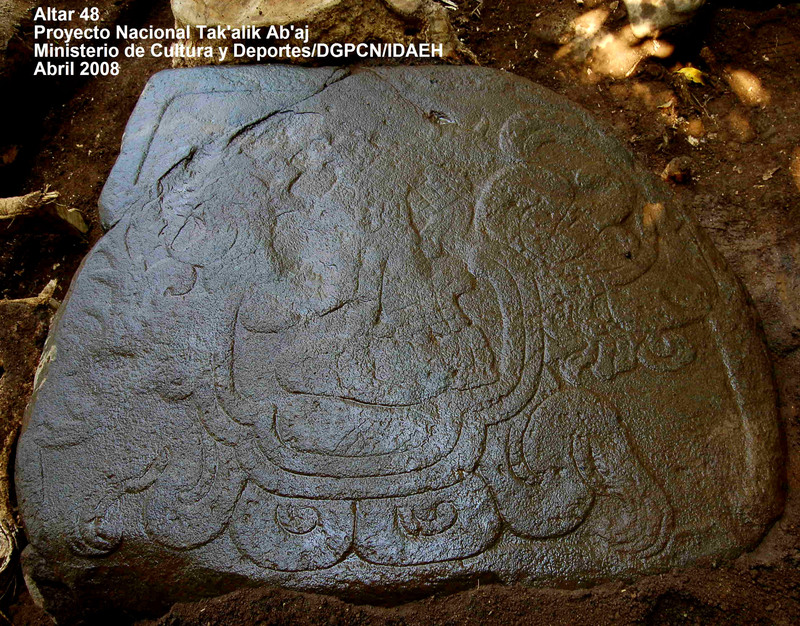 Inside the quatrefoil a personage depicted with headdress and loincloth is seated on his throne in Mayan fashion. Two sides of the altar present also a mythological theme each and the side at the base of the theme sculpted on the surface of the altar shows four early glyphs. These four glyphs appear to refer directly to this personage. The crocodile with the quatrefoil symbol on its back resembles the representations of the turtle with its shell in the form of the same symbol. 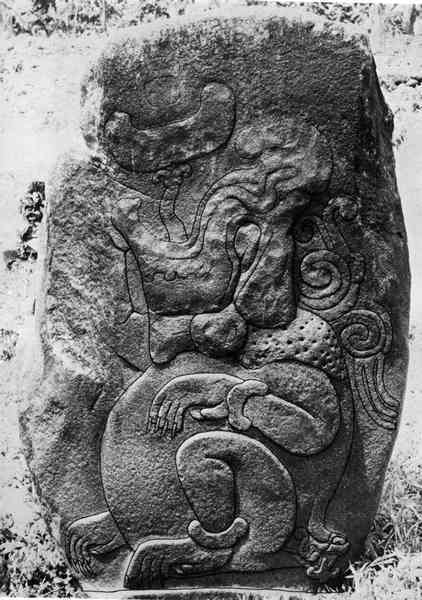 The figure of the Maize god emerging from the open shell of a turtle is frequently found in Maya iconography relating to the creation of the world. 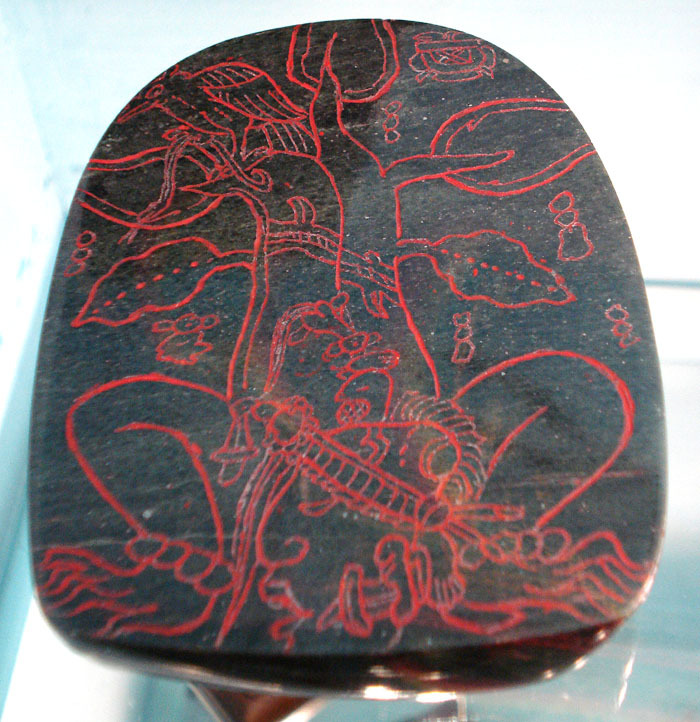 The four early glyphs open the possibility to relate this powerful mythological theme to a real personage, a ruler, in Late Preclassic times, when the early Maya system was "institutionalized" and the universal symbols "mint", which ruled through all epochs of the Mayan world. 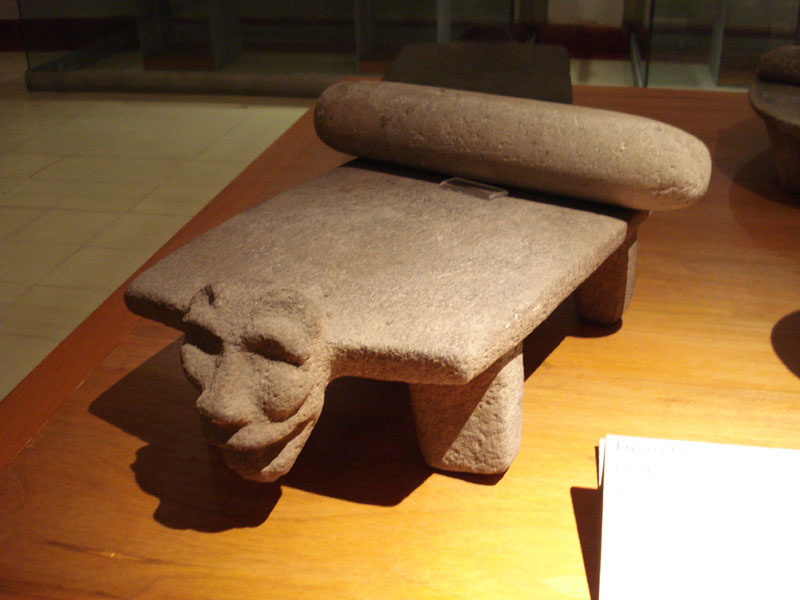 Altar 48 at Tak'alik Ab'aj might be one of the earliest mythological representations of Maya cosmovision used for political purposes. -end. 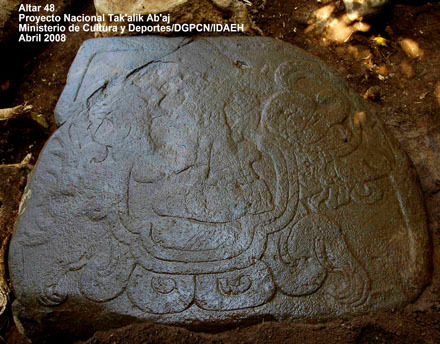 The new find at Tak'alik Ab'aj in Guatemala is of great interest, as this pre-Classic site is emerging as a key to the transitional period between the pre-Maya and the Maya. 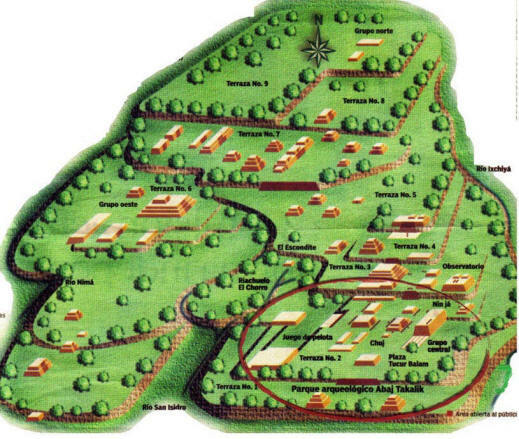 By "pre-Maya" I refer, especially in regards to Tak'alik Ab'aj, to the Izapan culture rather than the Olmec. 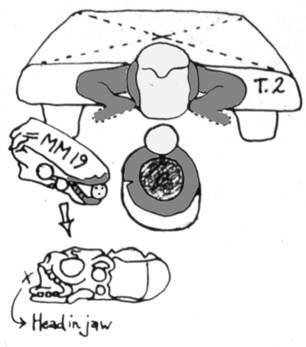 Archaeologists working at Tak'alik Ab'aj have made explicit connections with the Izapan tradition and art styles, detailing many stylistic parallels between the carvings found at the two sites, which are about forty miles apart as the crow flies. The new find is called Monument 48. It consists of a broad surface around the edges of which hieroglyphs are found. 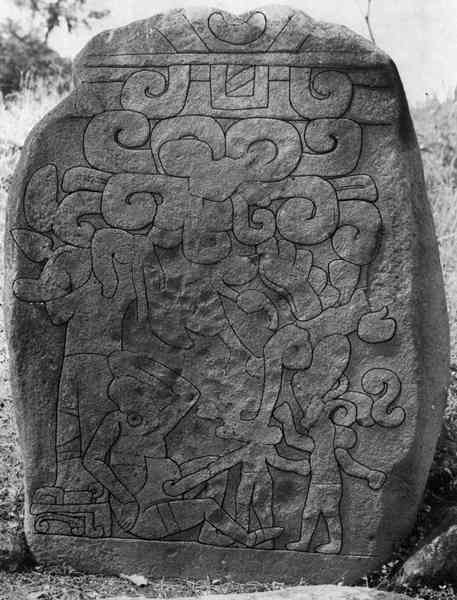 The imagery on the carved face is pictographic and very similar to several Izapan stelae. 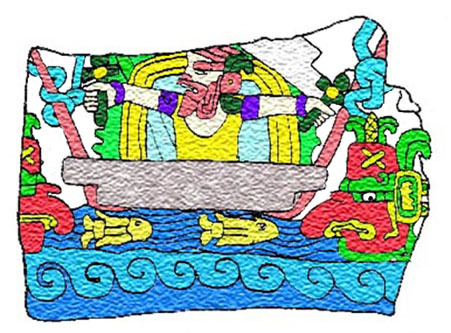 The placement of hieroglyphic writing in relation to Izapan-style iconography should be noted, as Izapa itself contains only two anomalous glyphs. This attests to the integration of older and newer forms of culture that has been proposed as a defining characteristic of Tak'alik Ab'aj. The carving was found underneath another stone which is believed to have been intentionally placed over it to protect the imagery - highlighting the monument's importance to the people of Tak'alik Ab'aj (in the sense that they wanted to preserve it). 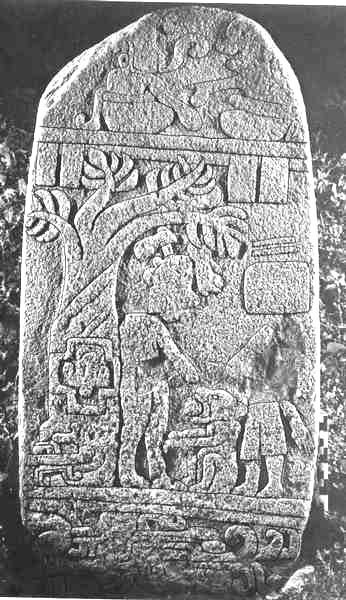 Monument 48 is thus considered to be an altar or perhaps a throne rather than an originally upright stela. 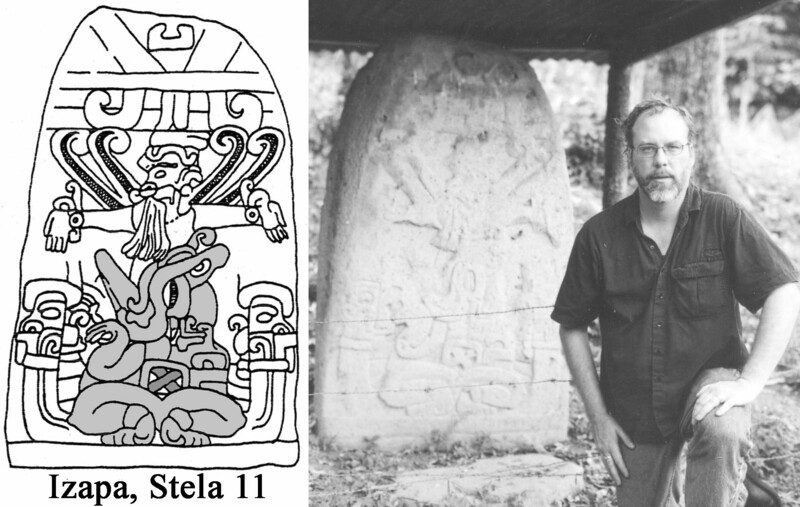 ...as well as Izapa Stela 22 (See "Stela 22: A Tri-level Deity Paradigm" in Part 2 of the essay here). ...which faces down the axis of the Group F ballcourt to align with the December solstice sunrise position. Thrones typically symbolize the concept of the "cosmic center"; they were thought of as places of interface between different levels of the cosmos and places of transformation and renewal. 1. David Stuart. 2005. 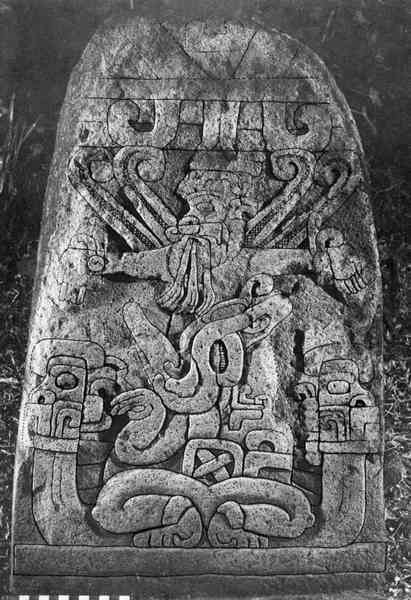 The Inscriptions From Temple XIX At Palenque. The Pre-Columbian Art Research Institute, San Francisco. Pages 72-75; 163-168. This academic work supports my thesis of astronomy encoded at Izapa, which the new Tak'alik Ab'aj Monument 48 reflects. It is, in fact, part of an orchestra of iconographically similar carvings, all of which refer to the solar deity or lord enthroned in the belly of the Milky Way. It was apparently recognized by the ancient Maya that this was the place of a celestial crossroads - the cross formed by the Milky Way and the ecliptic. That this location is also occupied by the nuclear bulge of our Milky Way's center - visible to naked eye skywatchers despite what overly abstract astronomers assert - should be considered very interesting. The image represents the birth of the sun, on several different temporal levels. Daybreak being one, the new year at the December solstice being another. 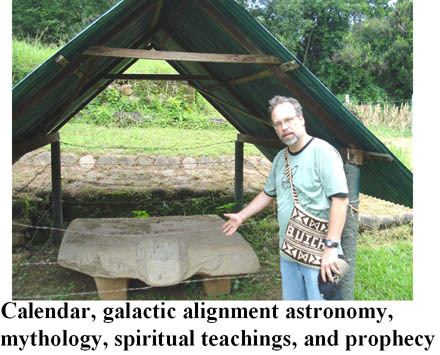 And, since the context of the iconography at Izapa involved the World Age doctrine, a larger "rebirth of the December solstice sun" is implicated, happening on the level of World Ages (specifically, in reference to the 13-Baktun World Age cycle in the Long Count calendar). Congratualions to Christa Schieber de Lavarreda and Miguel Orrego Corzo of the Proyecto Nacional Tak'alik Ab'aj for making an important new discovery that helps us understand the relationship between Izapa and Tak'alik Ab'aj, between the ideological and cosmological insights formulated at Izapa and their later adoption by the emerging Maya at Tak'alik Ab'aj and elsewhere.